Be a Guardian of the Garden Isle! You are here: Home / Blog / Be a Guardian of the Garden Isle! Guardian, defender, conservator, steward, caretaker, are all words to describe the residents of Kauai who make an effort to protect the beautiful garden island from impending threats such as invasive species. The Guardian of the Garden Isle network is KISC’s newest project, and is made up of concerned citizens who have pledged to help protect Kauai from invasive species. Invasive species threaten the native ecosystem, biodiversity, agriculture, and impact our quality of life. We have created this new network in order to expand this message across the island. 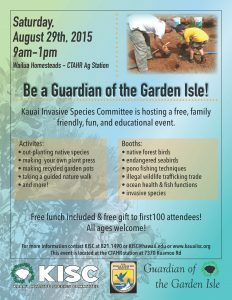 Since there is strength in numbers, the more Guardians there are, the more protected Kauai is from invasive species. It is quite easy to be a Guardian of the Garden Isle. There are all sorts of things you can do to help stop the spread of invasive species, and you can actually start right in your own back yard! Re-doing your landscaping? Opt for non-invasive plants when shopping at nurseries, or even better, plant native! Unfortunately, there are still invasive plants being sold across the state. As Guardians, we can change that. Keep in mind, every time you make a purchase you are voting. You are voting for invasive or not. If the demand for natives and non-invasives goes up, then naturally so will the supply. There are some great resources on line to help you make decisions about what plants to buy and stay away from. You can check out our KISC Pests page, to see all the invasive species we target in the forest. And the Plant Pono website offers a great tool, where you simply type in a plant name in the search box in the top right hand corner of the webpage, and bam! it tells you whether or not that plant is invasive. Plant Pono also offers a variety of alternatives to plant instead of invasives! It is also important to try to buy plants that were grown locally. Big Island, for example has numerous large nurseries, and is also a big supplier of orchids. Big Island also has widespread Couqi frogs and Little Fire Ants, which both happen to commonly spread by hitchhiking in plants. By supporting local growers, and buying plants that were propagated on Kauai, we can help to prevent the unwanted introduction of small invasive critters that can make a huge impact. There are other ways you can be a Guardian as well. Do you enjoy hiking or hunting? One of the reasons some invasives are so successful at taking over the forest is because their seeds spread very rapidly and easily. Some invasive plants have tiny seeds than can hitchhike in your hiking and hunting gear. The tread on the bottom of your shoes, your pockets, backpacks, and even dogs are all common transporters of tiny seeds. As a Guardian, you can make it a regular practice to wash or brush off your gear and dogs before exiting the forest. There are invasive species we know are only growing on the east side of the island right now, and it would be detrimental if they were introduced into Kokee via a hiking shoe. 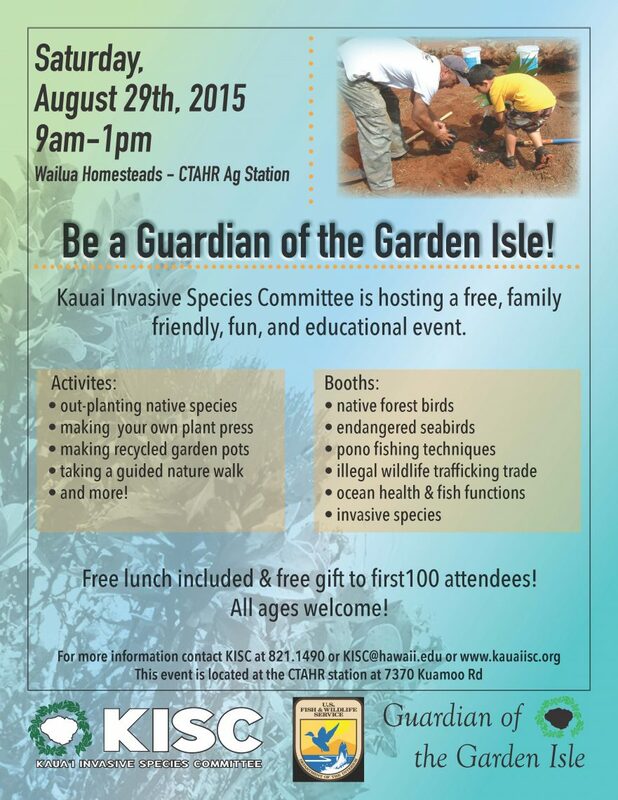 Being a Guardian of the Garden Isle helps protect the island’s native and beautiful biodiversity and resources. If you aren’t already sign up as a Guardian to receive our emails and updates on how to be a Guardian, click here! Also, KISC is hosting a free and family friendly event on Saturday August 29th for the public to come and participate in a variety of science and nature based activities and learn about all the efforts being made to protect the island. Come and join us! Click here for more details.